Online gaming experiences are dominated by shooters and sports games, while action games tend to be single-player affairs. But what would happen if 16-player deathmatches were populated with chainsaw-wielding maniacs and cybernetic ninjas instead of gun-toting army dudes? Platinum Games’ Anarchy Reigns answers this question. The 3D, arena-based brawler hosts chaotic battle royales where anything goes, along with a lengthy single-player campaign. 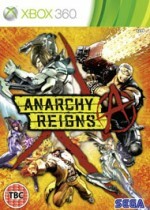 Anarchy Reigns feels like a hybrid of a fighting game and action game. Blocking attacks and pulling off flashy throws is as satisfying as it is in Street Fighter. Unleashing a flurry of light and heavy attacks against opponents is similar to action games like Asura’s Wrath (complete with ridiculous and powerful special moves). Combining familiar genres makes the game immediately accessible, with a gradual learning curve for those eager to learn the finer nuances of combat. Mastering techniques that let you bounce back from a rough landing or break a combo feels great and pays dividends. However, babysitting the clunky camera and selecting targets with the finicky lock-on system can spoil the fun. Juggling your enemy in the corner is a cathartic treat, unless you can’t see the flaming semi-truck b-lining towards you. The core of Anarchy Reigns lies in the competitive multiplayer mode. Match types range from tense one-on-one cage fights to a frantic 16-player battle royale with random environmental hazards, and everything in between. Taking on 15 other players is overwhelming enough, but it becomes even nuttier when the arena’s geography morphs – or when a gigantic death laser robot enters the battle. Sometimes these spectacular events amplify the fun, other times they result in frustrating deaths. Regardless, the fact that the tide of battle can turn on a whim keeps things exciting. Unfortunately, the 17 fighters (18 including Bayonetta, if you preordered) all play too similarly to make experimentation worthwhile. My favorite modes are those that dramatically mix up the formula. Capture the flag is a blast, especially when you smuggle the enemies’ flag down a back route and beat down a foe with it before scoring. Deathball plays like an even more violent version of rugby, with two teams passing and running a ball towards opposing goals. My team was endlessly slaughtered playing Deathball, but I still had a good time. The single-player campaign initially feels barebones and tacked-on, but gets better the deeper you dive. You play as either Jack or Leo, returning characters from Platinum Games’ grisly Wii title, MadWorld. The supporting cast is composed of other returning MadWorld characters and some new faces, all of which are playable in multiplayer after unlocking them via the campaign. This single-player mode plops players in a series of open environments where they must earn points to unlock new objectives. The majority of missions, whether timed or not, involve slaughtering waves of mundane mutant enemies. Racking up enough points unlocks the more exciting story missions, which pit you against other fighters and usually treat you to a goofy cinematic. The campaign starts out slow, but I grew to enjoy mindlessly bashing enemies with occasional tastes of Platinum’s trademark innuendos, corny humor, and gritty action. Anarchy Reigns’ multiplayer scratches an itch I didn’t know I had, but its camera faults and near-identical character move sets hold it back from scratching hard enough. However, online matchmaking is quick and easy, and the network fidelity held strong through every round I played. The campaign is rough at times but overall entertaining, though I wouldn’t recommend it to anyone looking for a high-caliber action experience. The 3D, arena-based brawler hosts chaotic battle royales where anything goes, along with a lengthy single-player campaign.